Let the festivities commence! From motorboat races on the Seine to the Grape Harvest Festival, and from World Championship Boxing Matches to Shakespeare in the park. The 1937 Exposition Internationale des Arts et Techniques dans la Vie Moderne (International Exposition of Art and Technology in Modern Life) had it all. 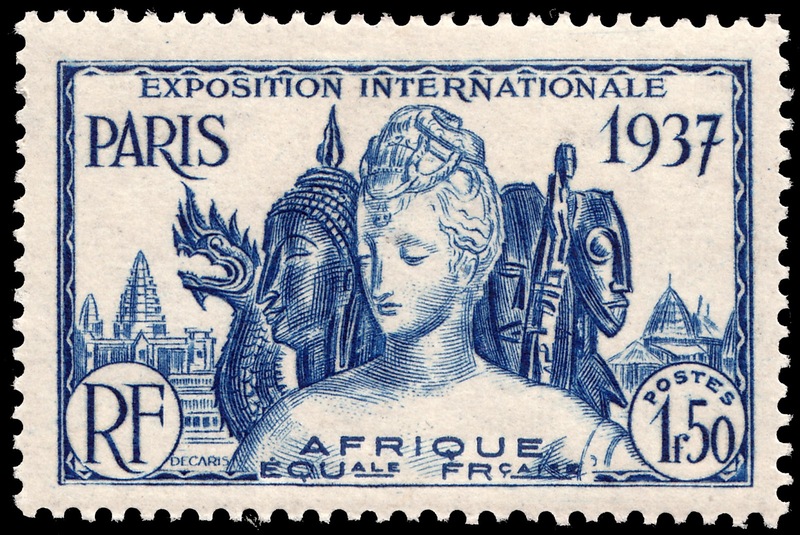 The Expo was held from 25 May to 25 November 1937 in Paris, France. Countries from around the globe converged on the "city of lights" to flex their muscles of national pride. Participating countries were invited to build their own pavilions. Some pavilions were rather modest. While others such as the Soviet and Nazi pavilions opted more for the ostentatious and colossal. For more on the Expo, click HERE. This World Expo was also a big deal in the world of philately. A group of France's best artistic minds were assembled to create a six stamp set that would be issued in twenty-one French colonies. This was the second omnibus series printed in France, the first being in 1931 for the International Colonial Exposition. Engravers such as Rene Cottet, Emile Feltesse, Pierre Munier, Antonin Delzers, and of course Albert Decaris contributed to the set. In fact, Albert Decaris both designed and engraved two stamps in this set. Below is a list of all colonies in which this set was issued. To celebrate the beginning of my studies into Albert Decaris' philatelic work for French Equatorial Africa, which in 1958 became the Central African Republic, I thought I would showcase his first stamps issued for this country. The 1937 International Exposition in Paris. Indeed, these were the first stamps issued with his name attached for many French colonies. Before seeing the stamps, let's have a little look at the country in question. French Equatorial Africa (French: Afrique équatoriale française), or the AEF, was the federation of French colonial possessions in Equatorial Africa, extending northwards from the Congo River into the Sahel, and comprising what are today the countries of Chad, the Central African Republic, Cameroon, the Republic of the Congo, and Gabon. After a referendum in 1958, in which the citizens voted for independence, AEF became the temporary association called The Union of Central African Republics. Then in 1960 the fully independent Central African Republic was formed. But we'll look at that change when I start studying the stamps Decaris produced for CAR. Now to the stamps. As I mentioned above, Decaris both designed and engraved his two stamp contribution to the Paris Exposition omnibus series. To look at the full set, click HERE. The issue dates of this series vary by colony. 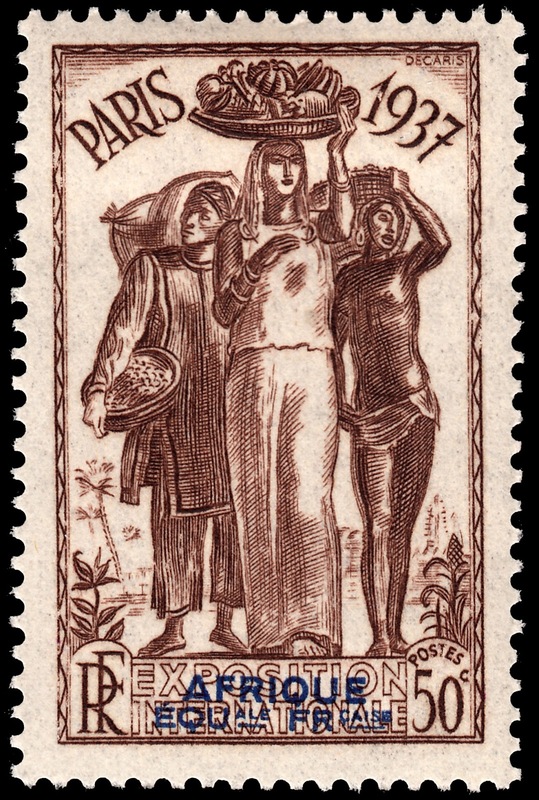 The FAE set was issued on 15 April 1937.